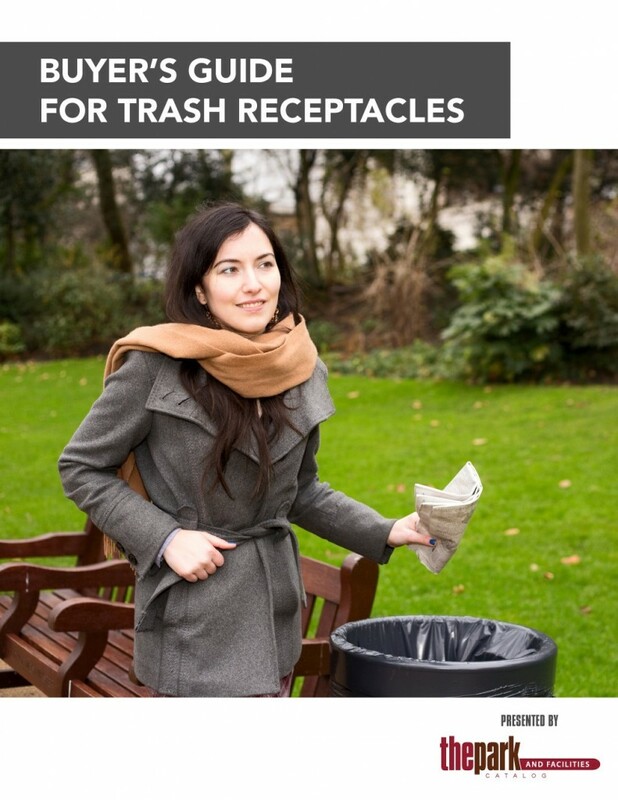 Buyer's guide for trash receptacles. Just like people judge a book by its cover (even when you tell them not to), they also judge your community by its appearance. There is a major difference between a town whose streets are lined with flowers and one lined with debris. That's when a simple strategy, such as an adequate supply of commercial trash cans is critical. Which area feels more inviting? The one to the left with a small trash can overflowing with litter, or the one on the lower right with the new, large empty trash can with an outdoor ashtray to reduce cigarette litter as well. Trash is nothing new, but our amount of trash has greatly increased since our grandparents’ generation. That’s because we’ve increased our production of plastics and disposables like diapers and paper products, while refusing to boost our recycling habits (65% of Americans don’t recycle according to Virginia Tech). As our trash increases, so does our littering habit. Keep America Beautiful, an organization that has dedicated the last 60 years to organizing volunteers to clean up litter, has a very useful Community Appearance Index. This assessment is conducted by local affiliates who gather annual data and survey local residents. The localized results help bring a focus to new programs and ideas that can help their town improve. Dealing with a major littering problem, the City of Los Angeles recently installed more trash receptacles to help decrease the litter. With only 1,000 commercial trash receptacles installed, littering was way easier than searching for one of the city’s few trash cans. That’s why Mayor Eric Garcetti installed 5,000 more trash receptacles for the community, initiated an Adopt-A-Basket program, and ordered that the trash cans were clean, free of cracks, and had properly closing doors. Mayor Garcetti’s Clean Street Strike Team cleaned up 500 tons of trash each week, with inspections that rated the cleanliness of the communities. His emphasis on cleaning the littered streets of Los Angeles is one that we can all admire. Whether you are a city planner, park manager, business owner, or concerned community member, it’s essential to put in the extra effort to keep your community pristine. A 2009 Keep America Beautiful study found that 93% of homeowners would think twice before buying a home in a dirty neighborhood. Realtors, homeowners, and industry experts all agree: litter decreases property values. Not only is it more inviting for guests, it’s also much more sanitary to stop the spread of illness and disease. Keep America Beautiful found that a strong contributor to littering behavior is the existence of litter. That’s why your first step in preventing litter is to find and add an adequate number of quality commercial trash cans. With a wide variety of shapes, sizes, and functions, it’s difficult for beginners to buy the perfect trash receptacle for their facilities and find the perfect placement. While you may not be excited about sanitation, we are trash experts and our tips can help you keep your facility as clean as possible, building a positive reputation to increase the guests to your facility. Pop Quiz! What do you think are the biggest sources of litter? So how can you prevent littering? Use this helpful checklist to get started. It’s clear that trash receptacles can help your facility prevent litter and boost cleanliness. 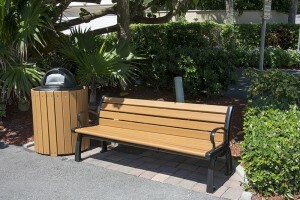 But poor trash can placement can mean your trash cans go unused, creating a litter problem. Carefully strategize your trash can placement before installing. First, pull out a map of your park or facility and find areas where sidewalks meet, where families have lunch, or other high pedestrian traffic takes place. Your trash receptacles need to be easily visible by first-time guests—if they have to search for it, then it’s too hidden! Next, and perhaps most importantly, visit the site and just watch. You may feel a little stalker-ish, but keep an eye on what guests are doing. Do they have bags of fast food with them? Are they smoking? Are they walking a dog? Record the amount of litter gathered in current commercial trash cans and speak with sanitation workers to discover any litter problems you need to solve at your facility. Observing the habits of your guests at different areas of the park will help you fully understand where trash accumulates and how to make guests most comfortable. Walt Disney was famous for this practice. That’s one reason why the Disney parks today are still models of cleanliness and a top-notch consumer experience. It will also help you determine where to place your facility or park trash cans based on guest behavior, not based on where they are easiest to empty. This will save you money and resources by installing the trash receptacles right the first time instead of guessing where to put them and adjusting later. Transition Points: When guests move from one area to another, they usually bring trash along. Place commercial garbage cans at transition points like train and bus stops, shopping malls, food vendors, and building entrances. Near Seating: Guests looking for a place to eat or smoke usually gather at picnic tables and park benches. If you don’t have enough commercial trash receptacles installed in these areas, you will find these tables and benches covered with litter—not exactly the best welcome for the next guests who wander in. After you monitor the habits and traffic of guests at your facility, it’s time to space out your commercial trash receptacle installation. As we indicated, Walt Disney was not only a great animator, but as the developer of his famous theme parks, he became the master of commercial garbage can placement. His top goal was to keep Disneyland looking spotless. He continually researched activity in his park and found that keeping trash receptacles no more than 25 feet apart was the optimum distance to deter littering. Disney even created the trash receptacles that empty from the bottom so you never see a maintenance worker emptying the trash. 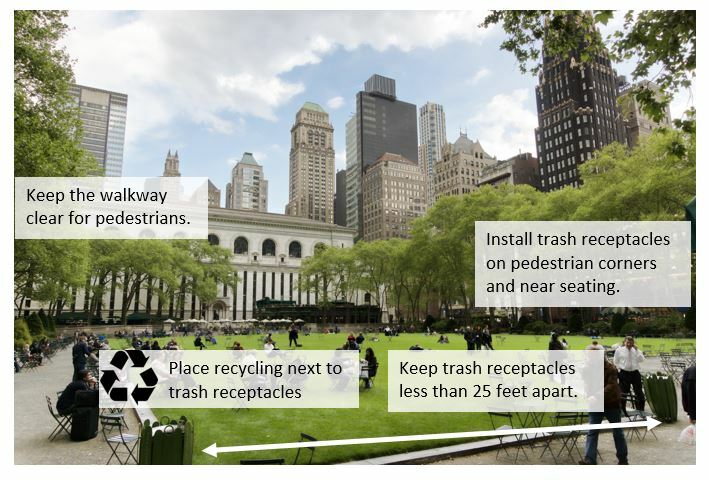 Keep America Beautiful surveyed 130 public places and found that as the distance between commercial trash receptacles increased, so did the amount of litter. Most littering that the organization observed occurred far from any park trash cans, an average of 29 feet. 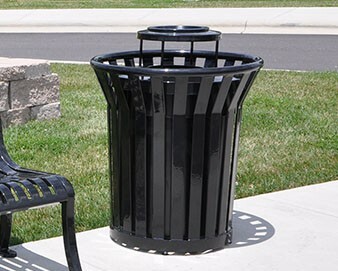 Outdoor trash cans usually have a higher capacity and are sturdy enough to withstand damage from people, curious animals, and extreme weather conditions.Consider installing add-ons like ash trays or lids to prevent scavengers. Always mount your commercial trash receptacle in the ground for stability against theft and harsh weather. Choose a material type that will withstand the outdoor conditions at your location (see below for more information). 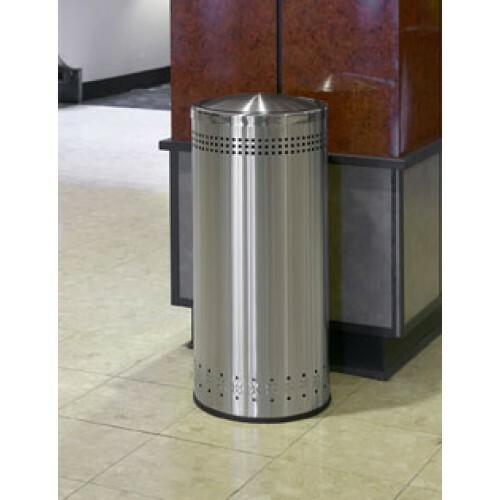 Whether you’re shopping for a food court, restroom, or office, there are plenty of commercial garbage cans specific to your business needs.Indoor trash cans typically have a lower capacity and are designed for specific purposes. For example, bathroom trash cans are made of stainless steel with either no lid or a simple foot pedal lid to prevent rusting or the spread of harmful bacteria. Simple office wastebaskets can be small enough to slide under your desk or medium sized for common areas. With the same variety of materials that you can find in typical trash receptacles (stainless steel, plastic, fiberglass, etc. 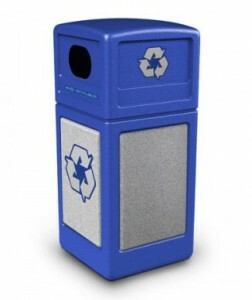 ), recycling receptacles are specifically branded with recognizable recycling symbols to make the receptacle look distinct from regular trash cans. Some are consistent with the city-wide design of recycling containers. 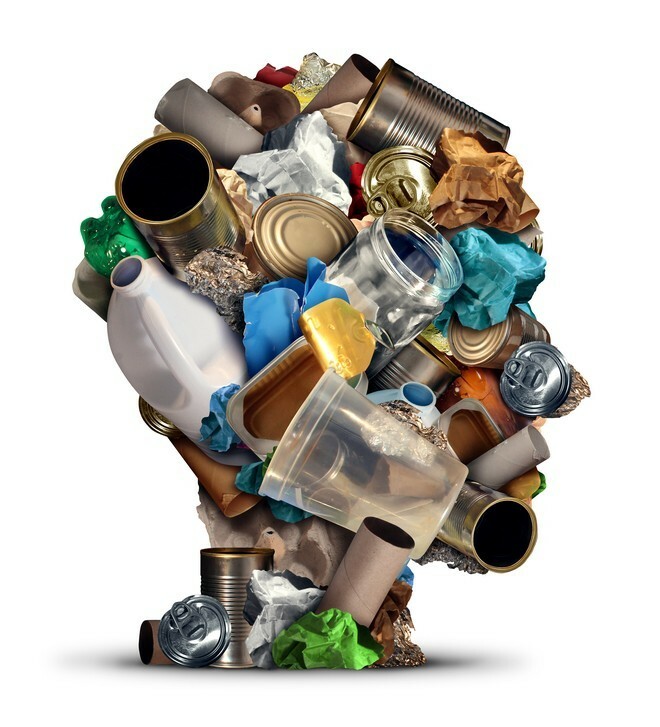 Others are separated into the different types of materials, like cans, glass, and plastic.Additionally, recycling cans typically have smaller openings to prevent trash and non-recyclable items from littering the recycling receptacle. Keep in mind that installing recycling receptacles can earn your business LEED credits to help it become more eco-friendly. Cigarette Receptacles Whether you decide to install a cigarette receptacle smoking urn with sand, an urn/trash receptacle combination, or a free-standing smoker’s station, there are several options to help guests dispose of their cigarette butts in easy-to-use disposal slots. Steel, plastic, metal, concrete, and other materials will keep your smoking urns safe and sturdy enough for frequent use. Keep your cigarette receptacles highly visible near building entrances (while still following local regulations about minimum distances from buildings). Outside ashtrays installed in high volume areas will need to be emptied more frequently through either a trap door on the urn, or simply pulling the cap off. High-capacity, temporary commercial trash receptacles are essential for festivals, concerts, carnivals, holiday events, and state fairs. When your facility is functioning at a much higher capacity than usual, trash accumulates more quickly—especially when food is involved.Easily transport your temporary park trash cans by purchasing one with wheels (like a trash cart), or using a park trash receptacle dolly. Without trash receptacles designed for dog waste, guests are much more likely to leave their pet waste and move on with their day. Pet waste can accumulate very quickly, making your park much less enjoyable and spreading harmful bacteria to water sources through rain runoff. About 40% of pet owners don’t clean up their dog waste, and with roughly 80 million dogs in America, it adds up quickly. The EPA has even recognized pet waste as a significant source of pollution, similar to toxic waste.That’s why pet waste receptacles with provided bags are essential at any park, apartment complex or community. 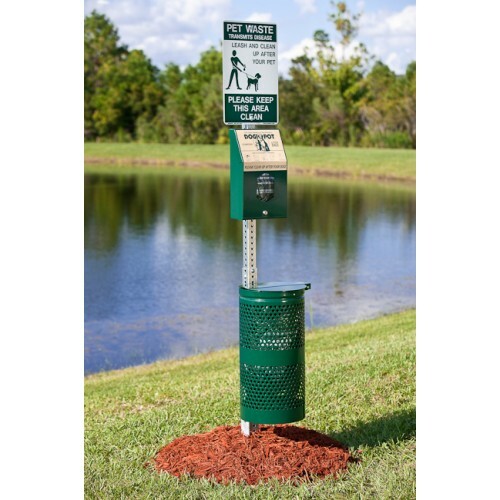 Install several along paths and trails with detailed messages warning pet owners of the local laws regarding pet waste. If guests are camping at your facility and throw away leftover food, it can be an immediate draw for bears, raccoons, wolves and other wildlife. Bears can smell food a mile away (their sense of smell is 100 times stronger than humans). Once they discover food in a trash receptacle, they will return for another meal the next day.Purchase an animal-proof trash receptacle with a deterrent latch to prevent wildlife from littering trash around your facility. When shopping for an animal-proof park trash receptacle, find one that has been tested by wildlife foundations in national parks. 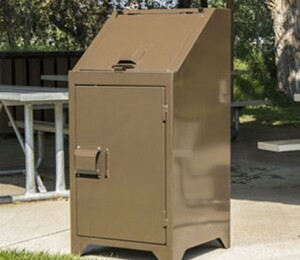 Once you’ve narrowed down to the type of park trash receptacle that will work best for your facility, there are some important considerations to help you find the perfect product for your park or facility. Make sure you carefully select commercial trash cans constructed from materials that best match your facility’s conditions. To prevent vandalism, get a steel trash receptacle. A hardy thermoplastic coating is best to remove and deter graffiti. For protecting trash in moist areas, go with recycled plastic, galvanized steel, or stone aggregate. For optimal outdoor strength, get fiberglass, plastic, aluminum, steel, or concrete trash receptacles. Look for park trash receptacles with warranties when shopping around if durability is a top priority. Near barbeque areas, avoid commercial trash receptacles made of solvent-sensitive plastics, which can melt from the heat of lighter fluids. Sturdy, immovable trash receptacles that don’t need to be mounted are made of concrete. 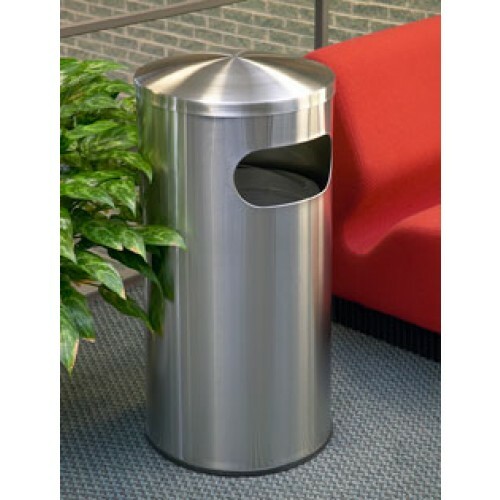 For fire-resistant, industrial trash cans, get galvanized steel. For a decorative look, go with mesh, painted steel or metal, fiberglass, or plastic to match your facility. You also want to match your facility’s existing conditions. Going for the rustic, woodsy look? Get a wooden commercial trash can. Sleek and modern? Aluminum or fiberglass will do the trick. 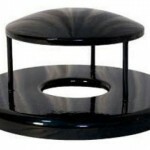 Got black furnishings? 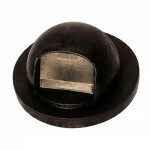 Go with steel or plastic depending on the durability your facility needs. Be sure to match any existing signage, benches, and tables to give your facility a cohesive look consistent with your brand. If your commercial trash receptacle’s capacity is too small, it will quickly overflow and your staff will have to empty it out frequently. If the capacity is too large, it will start to smell as it collects old trash. Use this guide for selecting the perfect capacity for your facility. Don’t let the smell of trash permeate your indoor living and working spaces. Some plastic and metal cans block odors from escaping. Also, be sure to keep a lid on bathroom trash cans. Higher capacity generally means more use. That’s why durability is an essential factor when looking at large capacity trash receptacles. Make sure your trash receptacle is made of sturdy material and isn’t easily knocked over—you may need to mount it to the ground. All it takes is a windy day to show the importance of your commercial trash receptacle lids. Additionally, openings that are too small will not accommodate the size of litter that your guests may need to throw away. At parks, guests may have larger items like pizza boxes that need to be recycled or throw in the trash. If the opening in the lid is too small, objects can easily get jammed and guests will quickly give up, leaving their trash on top or on the ground. The Project for Public Spaces recommends keeping your opening lower than 36 inches above the ground to accommodate handicapped guests. Ashtray top: According to Keep America Beautiful, cigarette butts are the most frequently littered items, comprising 38% of all roadway litter. The study found that cigarette butts were double the next highest source of litter. In the study, fewer nearby smoking urns and the existence of cigarette butts already littered on the ground increased cigarette littering—that’s why providing smoking urn receptacles are essential to preventing a cigarette littering problem at your facility. These ashtray tops double as both a park trash receptacle and an ash tray for putting out and disposing cigarettes in a safe and clean way. Some ashtrays have sand that may require refilling. 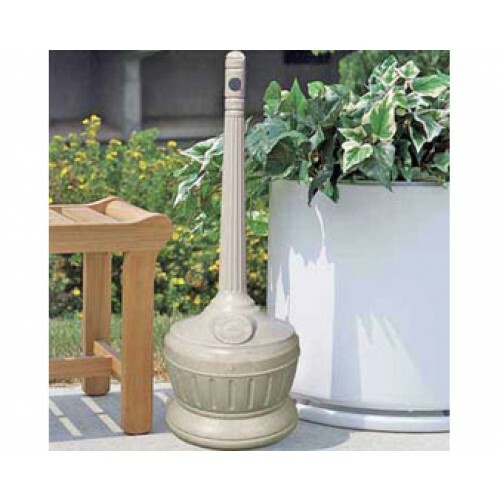 You can also purchase a stand-alone ash urn without the trash receptacle. Bullet top: Whether you prefer the open-top or push door, bullet-shaped trash receptacles are stylish, minimalist, and are shaped to promote easy depositing of garbage. Dome top: The dome or self-closing tops are resilient to damage weather like rain, snow, hail, ice, and heavy winds. If your trash receptacles won’t be protected by a building or roof, the dome top is a great option for keeping your trash protected from weather damage. Flat top/Pitch in: Flat top commercial trash receptacles don’t spread germs because guests don’t have to push any doors open. They make throwing away trash quick and convienent and are easy to maintain since you don’t have to worry about the door getting dirty or damaged. Hooded top: The hooded top provides similar rain protection as the dome top, but without requiring guests to push open any doors. 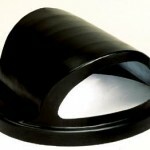 Rain bonnet lid: Purchase a commercial garbage can with a rain bonnet top or rain hood to keep the rain from getting your trash wet, while providing nearly 360-degrees of access. With the side door option, you can empty your park trash receptacles on the side with a door that slides, pulls out, or opens like French doors. These can be easier and faster for workers to empty, but can also be more susceptible to rust and damage since it has more moving parts. Traditional park trash receptacles empty through the top. If this is the type of commercial trash receptacle found throughout your facility or community, it may be ideal to stay consistent with this style. Bright, colorful trash receptacles are more likely to attract the attention of your guests. Similarly, you can put your logo or an anti-littering message on the commercial trash cans to communicate brand messages. Decorative trash cans with a cartoonish appearance can also catch the eyes of visitors before they decide to litter, as long as guests can clearly recognize the receptacles as trash cans. 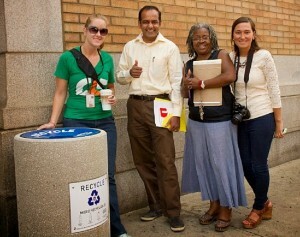 Keep America Beautiful conducted the nation’s largest litter study in 2009. They found that while most parks had trash receptacles, only 47% had ash receptacles or smoking urns and 12% had recycling containers. They pointed out the specific need for more cigarette receptacles and the importance of installing all three types of trash receptacles at your facility. The organization also recommends placing recognizable, clearly-labeled recycling receptacles next to trash cans to keep recycling easy. 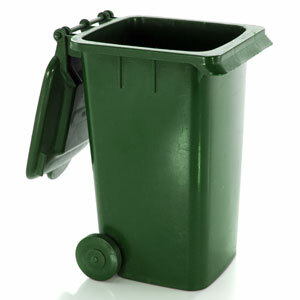 Bins need to remain clean, well maintained, and clearly marked to be inviting for guests. The City of Cleveland recently followed these exact steps, leading to literally tons and tons of recycled materials that would have clogged their landfills. 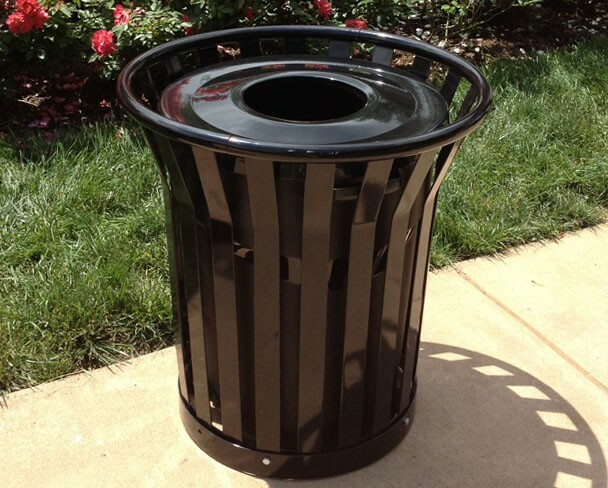 Once you purchase your commercial trash receptacle, you may think your research is finished, but it’s important to select high quality liners to prevent leaking and protect your trash receptacle for years to come. Metal or plastic liners work great, but if dangerous solvents like lighter fluid may be thrown away at your facility, avoid plastic. Buy heavy duty, tear-proof liners that won’t leak and can easily be tied and transported, even when full of trash. Securely attach your liner to the top of your trash receptacle to prevent trash from falling down the sides of the bag to the bottom of the can. Mounting your park trash cans into the concrete at your facility will help prevent theft or damage from harsh conditions. Some trash receptacles anchor into the ground, while others have weighted bases with sand or water. Larger park trash receptacles are most sturdy when mounted into sidewalks (called surface mounting), but you can also mount them into softer surfaces like grass and dirt (in-ground mounting). 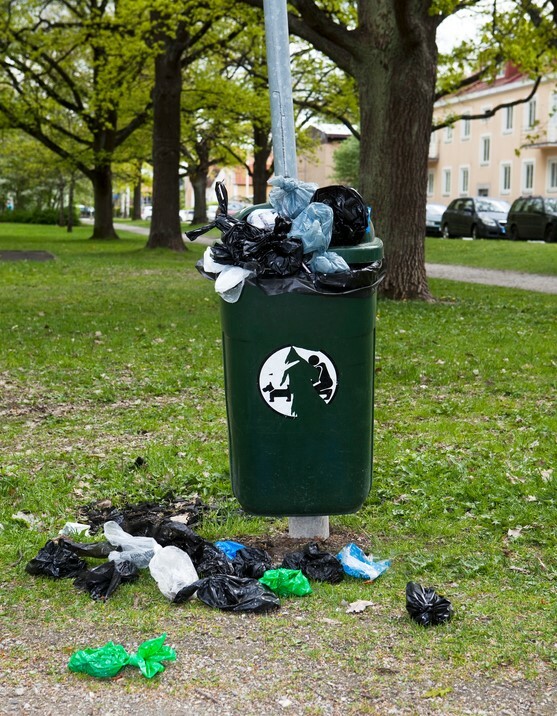 Smaller, surface-mount park trash receptacles are usually mounted to a pole, while larger trash cans are connected at the base. Follow the specific mounting instructions that come with your trash can to ensure stability. As you carefully install commercial trash receptacles throughout your facility and establish a strong maintenance schedule, you will experience the satisfaction of presenting a clean facility to your guests, who will be excited to come back. The Park and Facilities Catalog is headquartered in Boca Raton, Fla. 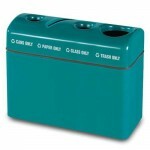 The company is a national manufacturer and provider of commercial trash receptacles. 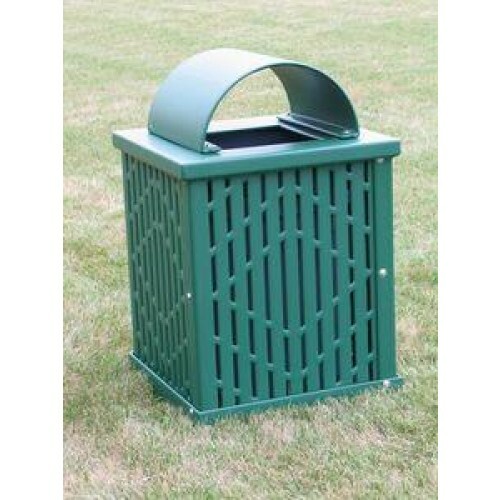 Our selection includes commercial trash cans made with nearly every type of material: steel, recycled plastic, concrete, aluminum, wood and fiberglass. 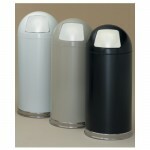 These are highly-durable outdoor trash cans made to withstand all types of weather and UV-rays. The company also supplies pet waste bag dispensers and disposal receptacles, animal-proof (bear-proof) trash receptacles, food court trash receptacles, restroom receptacles, step-on trash receptacles, custom logo outdoor trash cans, outdoor ashtrays, cigarette receptacles and commercial garbage can accessories. 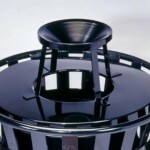 Our products are available in a large array of colors and protective coatings. Since 2001, we have supplied top quality bike racks to parks, schools, universities, restaurants, stores, malls, shopping centers, multi-family communities across the United States. The company is also a distributor of additional site furnishings such as park benches, picnic tables, trash receptacles, aluminum bleachers and hundreds of other items. CALL US TODAY AT 1-800-695-3503 for a free catalog or visit The Park and Facilities website.